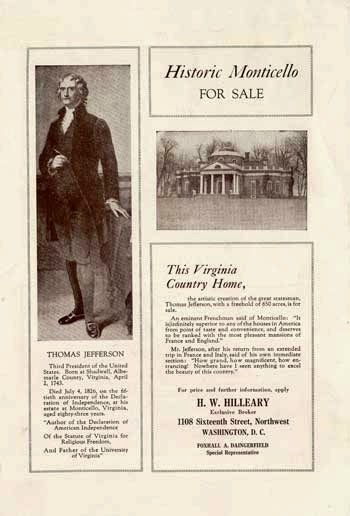 SELLING MONTICELLO: As I wrote in Saving Monticello, in the spring of 1919 Jefferson Monroe Levy, who had owned Thomas Jefferson’s house since acquiring it from the estate of his uncle Uriah Phillips Levy in 1879, hired a realtor to try to sell the place. Levy, a boom-and-bust real estate and stock speculator, had extreme financial reverses during World War I. He listed the property with H.W. Hilleary, a real estate broker in Washington, D.C., who also had offices in Warrenton, Leesburg, and Charlottesville, Virginia. Hilleary specialized in selling large country estates in the Old Dominion. “You are familiar, I am sure, with ‘Monticello,’ in the beautiful County of Albemarle, near the University of Virginia, also designed by Thomas Jefferson. This historic home, this architectural gem, this most picturesque estate, I have the privilege of offering. The present owner, for sentimental and other reasons, has never consented to part with it. I am allowed now to bring it to the attention of those who can appreciate and are able to own a property of such distinction and merit. I found several of those letters in the files at the Thomas Jefferson Foundation while researching the book. A few weeks ago, I exchanged emails with Herb Motley, a member of the Society of the Cincinnati. Mr. Motley had contacted Ellen Clark, the librarian at the Society’s headquarters in Washington, D.C., with a question about two letters about Monticello that he had found at the Minnesota Historical Society. They were written in 1921. Ms. Clark kindly put Mr. Motley in touch with me and he sent me scanned copies of the letters. They were written to Mr. Motley’s wife’s great grandfather, T.B.Walker, an extremely wealthy Minnesota timber baron and art collector. I hadn't seen them before. But they fit in with what I did find and what I wrote in the book. One of them is a letter from the real estate office of Herbert A. Sherman in New York City sent to Mr. Walker on July 27, 1921. The letter was signed by Howard Davis. Two things stand out in that letter. 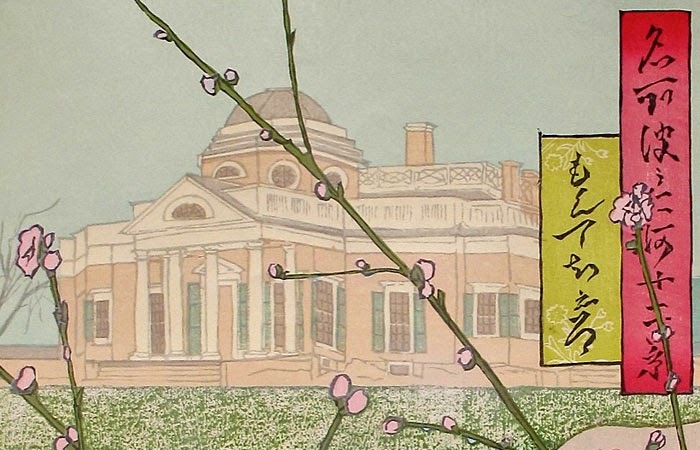 First, Levy most certainly was inclined to sell Monticello as early as 1914. That’s when he responded to repeated overtures from Congress to have the nation take it over as a shrine to Thomas Jefferson—efforts that Levy at first strongly resisted. Congress never did buy the place. 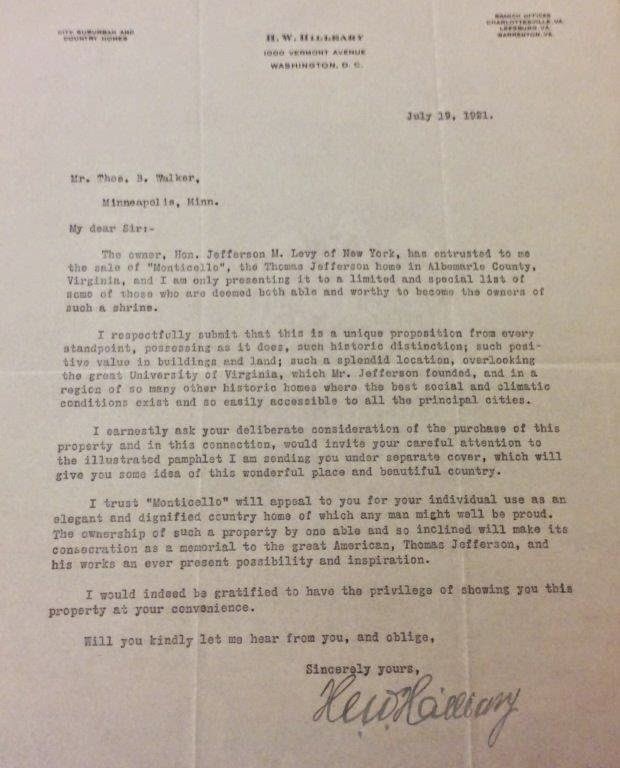 Then, as noted above, Levy hired Hilleary to sell Monticello in 1919. The second letter, below, is from Hilleary to Thomas B. Walker, dated July 19, 1921. It mentions no price and contains just about the same language Hilleary used in his other prospecting letters to other wealthy Americans, including at least one member of the DuPont family in Delaware. EVENTS: Only one in January: a talk on my latest book, What So Proudly We Hailed: Francis Scott Key, A Life on Wednesday, January 14 at 11:00 a.m. talk for the Tuckahoe Woman’s Club in Richmond, Virginia.